Anxiety Toolbox is a 3-part series that focuses on helping you understand anxiety symptoms and build skills to manage these symptoms. The three sessions are divided into content that builds upon itself. The sessions include modules dedicated to: (1) understanding anxiety, (2) introducing a method for slowing down and disentangling the experience of anxiety, and (3) developing alternative responses to anxiety. By the end of the workshop, you will have your own individualized plan for managing anxiety. Please come to CAPS during walk in hours (M/W/Th/F 9:30-11:30 & 1:30-3:30 and Tu 10:30-11:30 & 1:30-3:30) to schedule a workshop screening. Depression Toolbox is a 3-part workshop intended to help increase understanding of depression, as well as building skills to recognize and manage symptoms. The seminar uses CBT models to identify schemas (core beliefs), and how these impact thoughts, feelings, and behaviors. In the third session, this seminar offers instruction on how to interrupt and modify unhelpful thoughts and behaviors. Building Healthy Relationships focuses on identifying ways to foster healthy relationships via self-monitoring, effective communication, and conflict resolution skills. The three sessions are divided into content that builds upon itself. The sessions include modules dedicated to help you: (1) better understand your values and boundaries in relationships, (2) learn the role of culture in communication, different styles of communication, and strategies for effective communication, and (3) identify common causes of conflict and effective conflict management techniques. Finding Your Purpose focuses on building skills and creating flexibility in how you respond to distress. The 3 sessions include modules dedicated to: (1) helping you gain a deeper understanding of your concerns, (2) creating flexibility in how you view and approach these issues, and (3) helping you take steps toward living with a wide range of emotions. By the end of the workshop, you will have a better sense of your personal values and how you want to focus your energy. 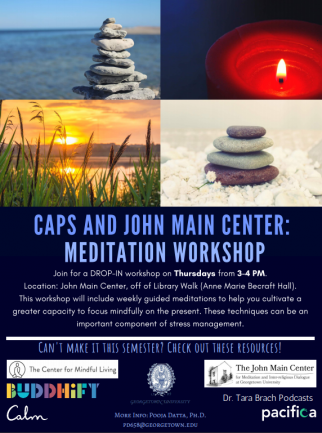 Managing Distress and Mindfulness is a 3-week workshop that focuses on distress tolerance, emotion regulation, and mindfulness. It was designed to help students manage overwhelming emotions.The skills taught in this workshop are drawn from Dialectical Behavior Therapy (DBT). Research has shown DBT to be an effective treatment for unstable emotions, relationship problems, impulsive behaviors, mood and anxiety disorders, eating disorders, and other concerns. We offer a variety of confidential support groups each semester in which students receive tremendous understanding, support and encouragement from peers facing similar issues. Students also gain different perspectives, ideas and viewpoints. Most students, while somewhat apprehensive at first, report that the group therapy experience was helpful far beyond their expectations. All CAPS groups are free of charge. 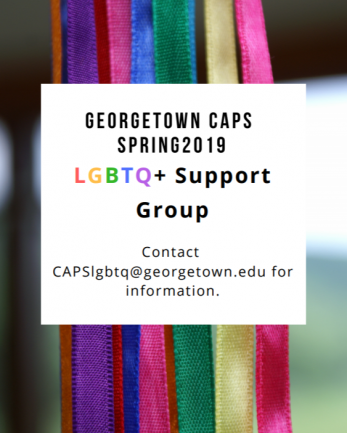 If you are interested in any groups, please contact the CAPS staff member listed in the group description to learn more. For general questions about CAPS group therapy, please contact Engin Ontiveros, Ph.D. at ee270@georgetown.edu. Group therapy provides a powerful venue for growth and change. It has been used effectively by mental health professionals for over 50 years. The intent is to help people who would like to gain support, increase self-awareness and learn new ways to cope with personal or interpersonal challenges. It is one of the most effective tools for addressing issues common among college students. 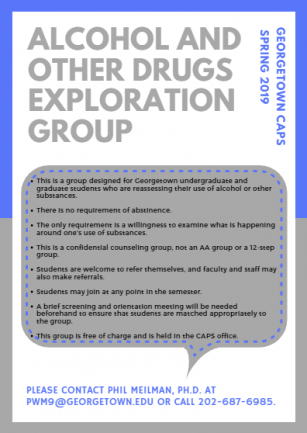 This is a group designed for Georgetown students who are reassessing their use of alcohol or other substances. There is no requirement of abstinence. The only requirement is a willingness to examine what is happening around one’s use of substances. This is a confidential counseling group, not an AA group or a 12-step group. Students are welcome to refer themselves, and faculty and staff may also make referrals. Students may join at any point in the semester. A brief screening and orientation meeting will be needed beforehand to ensure that students are matched appropriately to the group. This group is free of charge and is held in the CAPS office. Please contact Phil Meilman, Ph.D. at pwm9@georgetown.edu or call 202-687-6985. 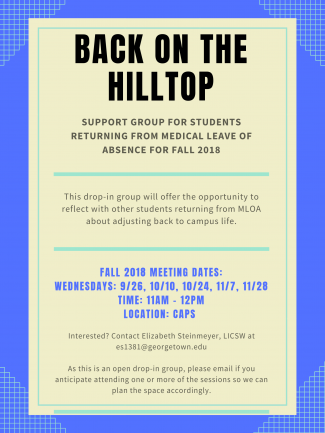 This is a support group for students returning Spring 2019 from Medical Leave of Absence. This drop-in group will offer the opportunity to reflect with other students returning from MLOA about adjusting back to campus life. Please email Elizabeth Steinmeyer, LICSW at es1381@georgetown.edu if you are interested in attending one or more of the sessions so we can plan the space accordingly. This is a group for students who have experienced the loss of a family member, love one, or acquaintance, recently or unresolved from the past. It is designed to provide a confidential and supportive place to express and analyze feelings around coping with major losses and to provide support for adapting to new ways for rebuilding a life after a major loss. Please contact Susan Gordon, Ph.D. at gordonsw@georgetown.edu to schedule a screening. This is a supportive therapy group designed for Georgetown students who have experienced sexual assault at some point in their lives. The purpose of the group is to provide members with support, connection, validation, coping skills, and education. This group is free of charge, open to undergraduate and graduate students, and will be held in the CAPS Group Room. Please contact Jenny Lloyd, Psy.D. at (202) 687-7080 or jl2355@georgetown.edu to schedule a brief screening. Stuck in the rigid patterns of an eating disorder? 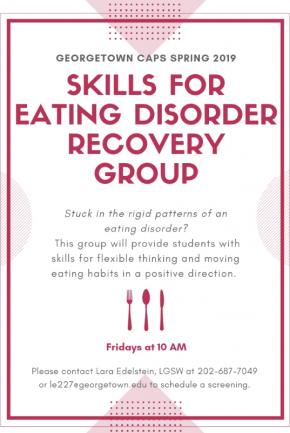 The Skills for Eating Disorder Recovery group will provide students with skills for flexible thinking and moving eating habits in a positive direction. This group is free of charge and will be held weekly on Fridays at 10am in the CAPS Group Room. Please contact Lara Edelstein, LGSW at 202-687-049 or le227@georgetown.edu for a brief screening appointment. This is a professionally-run therapy group intended for lesbian, gay, bisexual, transgender, queer, questioning and/or gender non-binary undergraduate and graduate students. It is designed to provide a confidential and safe place for looking in depth at individual concerns about coming out, relationships, family, academic, and community/university concerns unique to LGBTQI students. Group objectives include: gaining understanding and insight into one’s own interpersonal dynamics, improving one’s self-esteem and sense of self-worth, sharing and reviewing life experiences, exploring new ways of interacting, understanding and expanding relational skills, and exploring mental health concerns (e.g., depressive and anxious symptoms). This group is free of charge, open to undergraduate and graduate students, and will be held in the Darnall Conference Room. Please contact Matthew Worhach, Ph.D. at mw1148@georgetown.edu to schedule a screening. This insight-oriented group provides a safe environment for exploring yourself and interpersonal style in areas such as trust, intimacy, anger, assertiveness, taking risks, and dealing with authority. 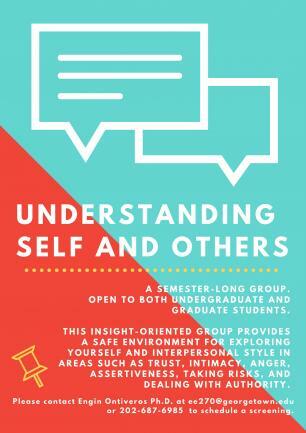 This semester-long group is open to both undergraduate and graduate students. 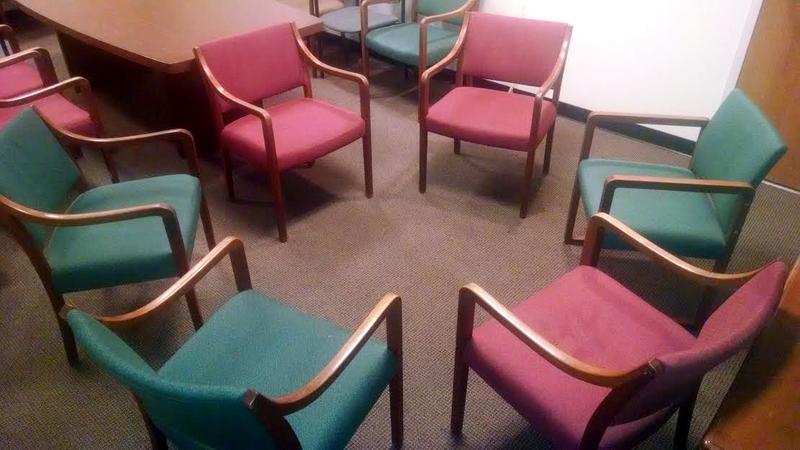 This group is free of charge and will be held weekly in CAPS Group Room. Please contact Engin Ontiveros, Ph.D. at ee270@georgetown.edu to schedule a screening.